The 2013 Integrated Optics for Undergraduates (IOU) REU funded 4 participants at 3 CIAN partner institutions including: Columbia, University of Arizona, and UCSD. All 4 participants completed the post-program survey. When asked who was most responsible for mentoring the participants’ research over the summer, 75% of respondents (3 participants) indicated that a graduate student was most responsible, and 25% (1 participant) said a faculty member was their primary mentor. Expectations for results were realistic. I felt like a valuable team member. The guidance I received from faculty was appropriate. o a highly successful experience. 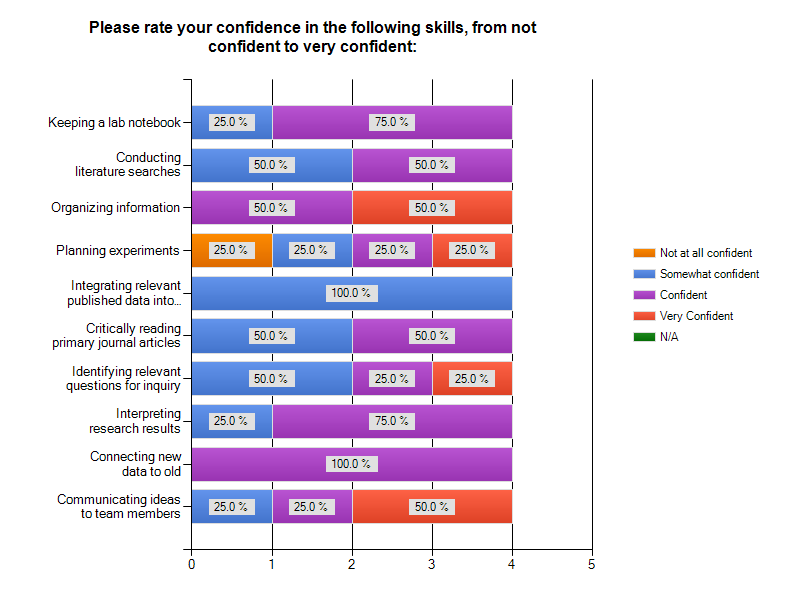 The next section asked students to rate their confidence in specific research-related activities, and following the IOU program, only 22% of the 40 responses in the item matrix were “Somewhat confident” responses (See Figure D). This is much less than what was seen on the Pre- IOU program survey, where 38% of the total responses were “Somewhat confident” or “Not confident at all” (See Figure C). 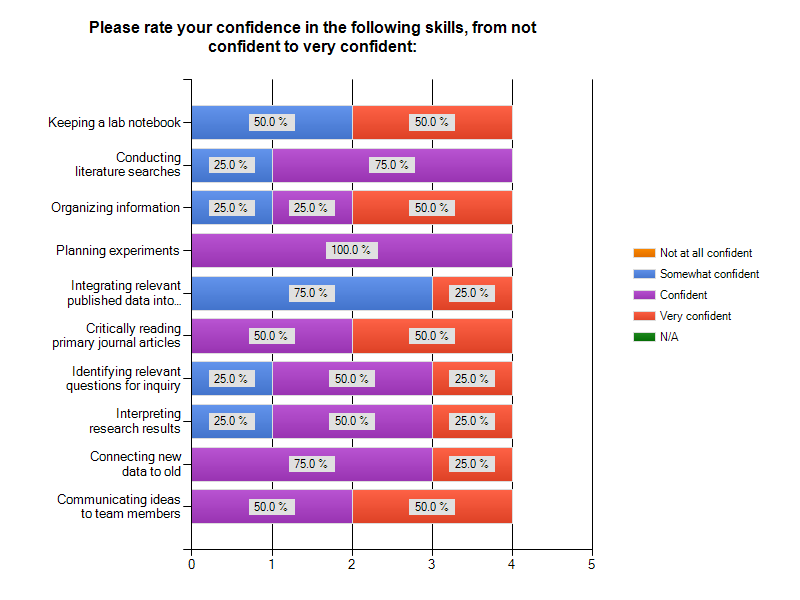 In addition, 75% said that they were Confident or Very Confident with regards to “Identifying relevant questions for inquiry,” “Interpreting research results,” “Organizing information,” and “Conducting literature searches.” Upon completing the REU program, student ratings indicate only two skills that still show potential for improvement, which were “Keeping a lab notebook” and “Integrating relevant published data into your research project.” Overall, students were much more confident in their abilities after the REU experience. I think of myself as an engineer. I am confident in my ability to work in a research lab. I am going to pursue graduate studies in engineering research. I am confident about my ability to access experts in the engineering field. I think that it is important to make oral presentations about my scientific investigation. Surprisingly, attitudes regarding the above statements did not change significantly after students completed their summer program (See Figures E and F for complete results). Both before and after the program, there were six responses of Neither agree nor Disagree among the various items, and there were only 2 more Strongly Agree responses on the post survey than on the pre survey. That being said, there were a couple important changes in response patterns. 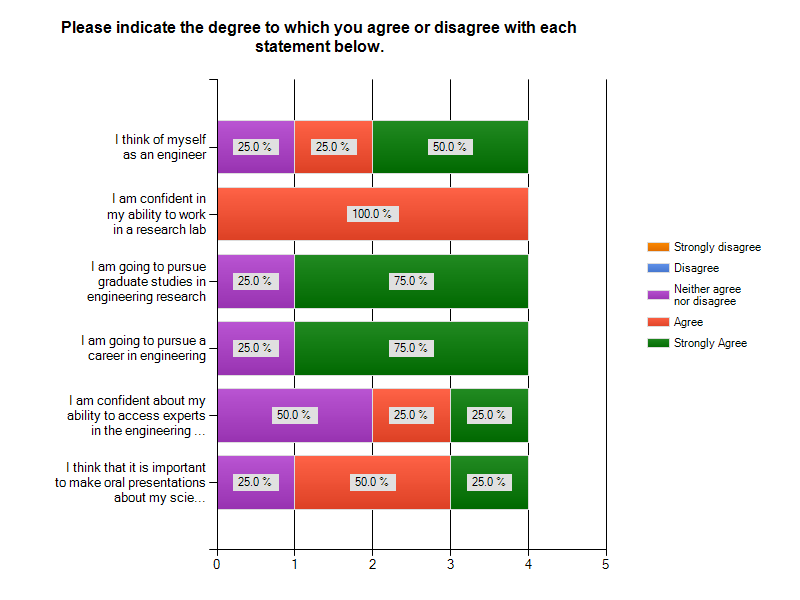 First, regarding the statement, “I am going to pursue graduate studies in engineering research,” 75% selected Strongly Agree on the post survey, compared to only 25% on the pre survey. This indicates that students were more eager to pursue graduate school after having worked in research labs with graduate students over the summer. 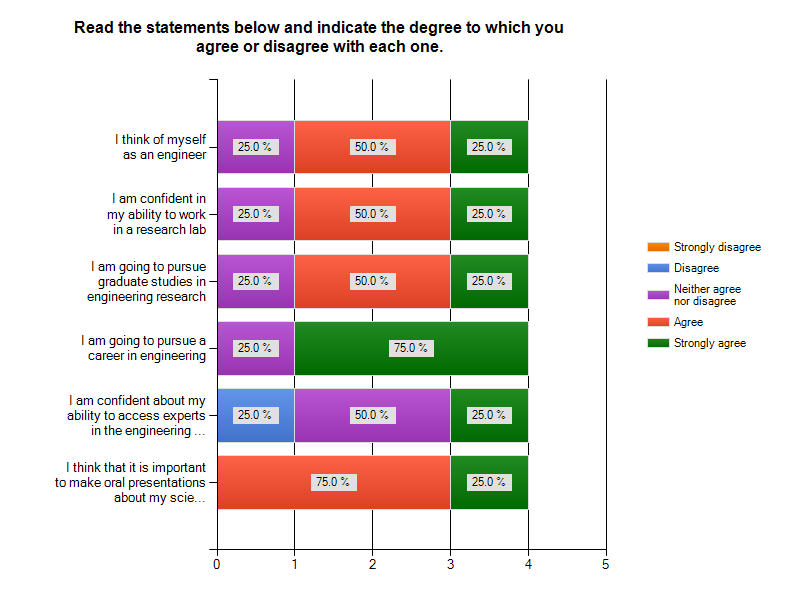 Second, after completing the internship, two individuals Strongly Agreed that they see themselves as engineers compared to only one who Strongly Agreed before the summer research experience. Also, after the REU program 50% (2 students) Agreed or Strongly Agreed about their confidence in accessing experts in their field, compared to only 25% before the program. This increase in optics knowledge suggests that the REU program was an effective, educational experience for the majority of participants. When asked what sector they would most like to work in, participant views were exactly the same as before their REU experience, with Academia being the most preferred work setting (4 out of 4 participants indicated they were “Somewhat Interested” or “Very Interested” in Academia as a workplace both before and after the REU program). The people I met who are now friends and future colleges. Experiencing the graduate research environment and interacting with graduate students who made graduate school seem interesting and promising. Being exposed to a field I knew very little about, and finishing with more knowledge and experience in an actual lab. The amount of debugging necessary in the code for the project. I didn’t know much about what I was doing. Understanding previous optics research and applying it to my project. The pressure of presenting and feeling like my work was not adequate, even though it was well done.